Kenya Wildlife Service rangers preparing a rhino for translocation at the Nairobi National Park. Four days after eight black rhinos died at the Tsavo East National Park following their translocation from the Nairobi and Nakuru national parks, the Kenya Wildlife Service (KWS) has yet to address the matter publicly, raising suspicion over what happened. Senior KWS officials remained tight-lipped, even as local and international conservationists mounted pressure on the agency to take responsibility for the animals' deaths. The eight were part of a herd of 11 recently moved recently due to overcrowding in the Nairobi and Nakuru parks, which was hindering breeding. The newly established, 100-square-kilometre Tsavo East Rhino Sanctuary in Kenya's oldest and largest national park was expected to be more conducive for breeding. The programme targeting 14 rhinos was jointly conducted by KWS and the World Wide Fund for Nature (WWF) at a cost of Sh100 million. 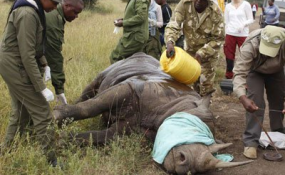 The ranger who oversaw the translocation refused to talk about the issue, while Mr Linus Kariuki, the Kenya Rhino programme coordinator, said he was on leave, only days after the latest batch of rhinos was moved from the Nakuru National Park. KWS spokesperson Paul Gathitu could not be reached for comment. Conservation activists Paula Kahumbu and Chris Diaz expressed dismay at the tragedy, which made headlines in the global media, including Fox News, CNN and the Associate Press. National Geographic described the deaths as "a major step back", which "undermines years of conservation efforts" of endangered animal species. Translocating rhinos is a high-risk and delicate operation that requires wide-ranging studies before implementation. Besides, there are only 745 black rhinos left in the country. And when it is sponsored, it is thoroughly scrutinised. Which brings to the fore the question: Was the multi-million move pointless? KWS suspects that the animals died from salt poisoning after drinking highly saline water in their new surroundings. But the question is whether the agency conducted thorough tests to determine that the new environment was suitable for the animals? And, why did it move so many animals at once? Or was foul play involved, and if so, who could have done it and why? What is even more bizarre is how the rhinos, under 24-hour surveillance by armed rangers, could all have died at once. And will the remaining three survive? These are some of the questions that remain unanswered as conservationists try to figure out what might have happened. The details of exactly when the animals died remain foggy. Initial reports emerged on Friday last week, but some sources claim that the animals could have died up to two weeks earlier. The translocation plan sparked off controversy right from the beginning, late last month, as conservationists and other parties questioned why the rhinos were being transferred from a public protected area to a private sanctuary. But KWS reassured all that the Tsavo National Park Rhino Sanctuary was, in fact, a public facility. Some people have accused KWS of a cover-up whenever endangered animals die in the parks. Daily Telegraph journalist Adrian Bromfield claimed that the KWS concealed the deaths of a number of rhinos that were killed in the Maasai Mara Game Reserve a month ago. Prof Peter Gathumbi, a senior veterinary pathologist from the University of Nairobi, and Dr Markus Hoffmeyer, a rhino veterinarian and translocation expert from South Africa, have been hired to investigate the rhino deaths. The results of the inquest are expected later this week, according to the Ministry of Tourism and Wildlife. The translocation has also been suspended. The KWS has vowed to take disciplinary action against its rangers if it is found that negligence played a part in the deaths. However, it remains to be seen whether the findings of the investigations will be made public, as promised by the government. Kenya has a total of 1,258 rhinos. These are found in intensive protection zones (IPZ), sanctuaries and free range. There are 16 rhino sanctuaries in the country. At 745, Kenya has the third largest population of black rhinos in the world. Rhinos mature after seven years.